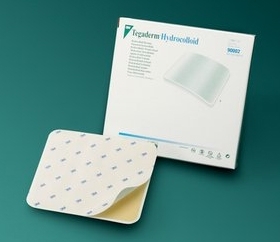 3M Tagaderm Hydrocolloid Adhesive Dressings have an innovative design that provides a long wear time for partial-to-full thickness wounds with low-to-moderate exudate. They feature an inner layer of hydrocolloid adhesive that absorbs exudate – higher absorbency than the leasing hydrocolloid in the first 48 hours. The waterproof film border adheres firmly. The dressing adhesive adheres to skin in the presence of moisture. An outer barrier film protects the wound and periwound skin from contaminates, body fluids, bacteria and viruses. The dressings continue to adhere and protect the wound in the presence of incontinence. Proven up to 7 days wear time provides undisturbed moist wound environment which has been shown to enhance healing. The smooth outer surface helps reduce the risk of sheer and friction. Long wear times means less dressing changes and potentially lower costs. 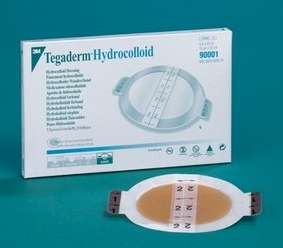 Tagaderm Hydrocolloid Dressings are available in three convenient shapes – oval, square and sacral. Oval and sacral shapes have a film border. 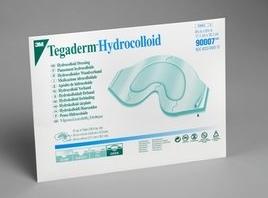 Tagaderm Hydrocolloid Dressings provide excellent patient comfort, dressing adherence and wound management. The flexible, conformable, low-profile dressings are comfortable because there is less bulk to catch on bed linens. With film dressing border, there is less likelihood of edge lift. Water resistance allows the patient to shower or to have a bed bath.